With the Dow Jones Industrial Average down nearly 5% this year, dividend stocks are the most stable way to make money in this volatile environment. These stocks provide steady income regardless of how the markets move. That's why we've gathered a list of the best dividend stocks to buy in 2016. 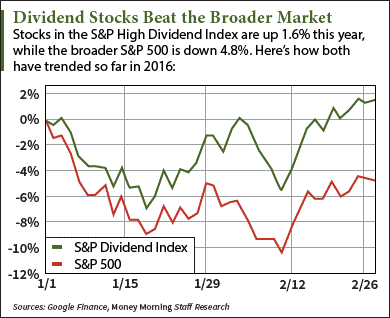 Now is a great time to turn to dividend stocks, as they've greatly outperformed the broader markets. The S&P High Dividend Index, which tracks 80 high-yielding public companies and serves as the benchmark for income investors, is up 1.6% so far this year. That beats the S&P 500 by 6.4%. "Dividend-paying stocks tend to be more stable than their non-dividend paying brethren – particularly during rocky stock markets," explained Money Morning Chief Investment Strategist Keith Fit z-Gerald back in 2008 when the recession was starting to rear its ugly head. "In other words, stocks that have income streams attached are treated better, especially when the going gets tough." Another big reason why dividend stocks have become popular is the U.S. Federal Reserve's hesitance to hike interest rates this year. During last month's FOMC meeting, Fed officials expressed concern about the global slowdown's effect on the U.S. economy. This dovish sentiment makes dividend stocks more attractive since higher interest rates apply financial pressure on businesses and lead to lower payouts. Many investors have become particularly infatuated with "dividend aristocrats." These are companies on the S&P 500 that have boosted their annual dividends for at least 25 years in a row. Well-known dividend aristocrats like Procter & Gamble Co. (NYSE: PG) and Johnson & Johnson (NYSE: JNJ) are up 1.9% and 3.1% this year, respectively. But a company should boast more than a high dividend to be worthy of your portfolio. That's why we've found three dividend stocks that not only have high yields, but also high growth potential thanks to a number of profitable emerging trends. Dividend Stocks to Buy No. 1: Phillips 66 (NYSE: PSX) specializes in processing, refining, and marketing oil, natural gas, and other petrochemical products. The company was originally merged with Conoco to create ConocoPhillips (NYSE: COP) in 2002 before being spun off as its own downstream business more than 10 years later. Phillips 66 has outperformed a number of Big Oil stocks recently. While companies like Exxon Mobil Corp. (NYSE: XOM) and Chevron Corp. (NYSE: CVX) have fallen 6.6% and 18.3% over the last year, PSX stock is up 7.8% since last March. Part of the reason is its consistently strong earnings. Despite the 62% crash in oil prices since June 2014, Phillips has beaten earnings per share (EPS) expectations in each of the last six quarters and raked in a whopping $99 billion in revenue last year. Its ability to stay profitable comes from its insulation from the volatile price environment. Since the company makes most of its money from oil refining rather than oil production, its profit isn’t directly influenced by lower demand. “It doesn’t drill for oil or natural gas, which means it’s not as vulnerable to sustained low oil and gas prices as other oil companies are,” Fitz-Gerald said. PSX also has one of the strongest dividend policies in the energy sector. Since the company’s formation in 2012, its quarterly dividend has nearly tripled from $0.20 per share to $0.56. It currently offers a 2.6% yield. Dividend Stocks to Buy No. 2: Altria Group Inc. (NYSE: MO) is a multinational corporation that primarily sells alcohol and tobacco products. MO stock was one of the best-performing consumer goods stocks last year, gaining 15% to $58.21 a share in 2015. It's currently up 5.7% in 2016. But Altria also happens to be one of Fitz-Gerald's favorite long-term stock picks. That's because the company has one of the strongest and most reliable dividend policies on the market. It has raised its quarterly dividend 49 times over the last 47 years. Not to mention the company's profit margin sits at a stellar 27.8%, according to Yahoo! Finance. This means its future profit potential is poised to withstand any downturns in the broader market. "While Altria's profit margin has been volatile, it's never dipped below double-digit levels despite historically unprecedented conditions over the last five years," Fitz-Gerald told Money Morning readers on Feb. 19. "That's an important consideration because profit margins typically fall when companies are forced to lower their prices to compete with an increasingly small pool of consumers during recessionary times." Altria raised its quarterly dividend to $0.56 per share last September and is expected to increase it again in 2016. MO stock currently yields 3.7%. Dividend Stocks to Buy No. 3: Dominion Resources Inc. (NYSE: D) is an energy company based in Richmond, Virginia. The firm owns a number of significant interstate pipelines, including the Atlantic Coast Pipeline, which will serve utility needs in Virginia and North Carolina. The company's fourth-quarter earnings jumped 47% year over year to $357 million. Dominion made headlines on Feb. 1 when it acquired Questar Corp. (NYSE: STR) for $4.4 billion. The company will inherit Questar's 3,400 miles of natural gas pipelines and more than 1 million Utah customers. These have earned Questar roughly $425 million in annual profit. But Dominion will also benefit from the emergence of an integrated liquefied natural gas (LNG) market. According to Money Morning Global Energy Strategist Dr. Kent Moors – a 40-year oil industry veteran and top advisor to U.S. and Russian energy agencies – the company will play a critical role in the development of LNG spot markets. This will inevitably increase natural gas demand and boost earnings for major gas exporters like Dominion. "With LNG providing the rise of genuine spot markets and a wider array of pricing points, the importance will move from the impact of transit to the importance of usage," Moors explained back in August. "Henry Hub is already becoming less significant, while Dominion's South Point in western Pennsylvania already has more contracts." Dominion's quarterly dividend is $0.70 per share and has been hiked every year since 2004. D stock has a yield of 4% and is up 4.1% over the last three months.